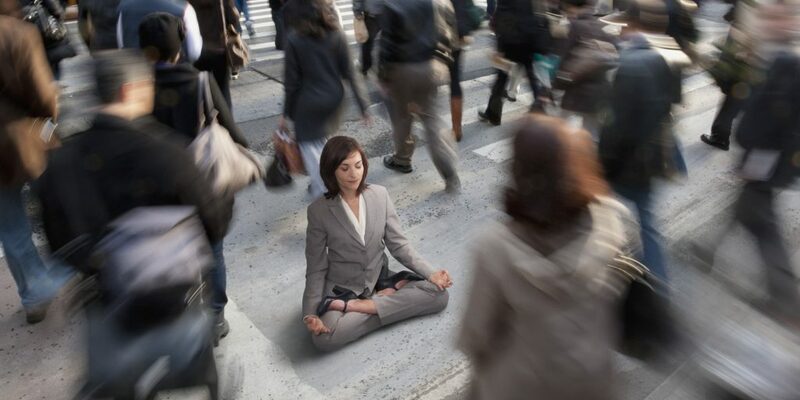 You have probably heard about the benefits of a regular meditation practice for your career or business. If it’s so undoubtedly good for us then why are we all not doing some rendition of this woman during our lunch breaks? Perhaps you can relate to these, or you may have your own reasons for not wanting to meditate. Or perhaps you’re just fed up of people with too much time preaching to you about how to live your life. I know I felt this way. Maybe it’s helpful to do away with the word ‘meditation’ and all its connotations. There are dozens of different forms of meditation – from the completely secular mindfulness apps to the 10-day silent Buddhist retreats. What it essentially boils down to is having the time to pause and reflect on what’s going on in our minds and bodies. It doesn’t have to be an hour, nor does it need to 20 minutes. There is no fixed time of day to practice. There is no right way. You don’t have to be spiritual at all. Just a few minutes a day to close your eyes , observe your thoughts , relax your body and then go out into the world and smash it. So with that “in mind”, here are some practical ways in which “doing that sitting stuff in silence with your eyes closed” can help you get that promotion, close that deal or complete that project by the deadline. 1. Mindful Efficiency : Mindfulness encourages us to be in the present moment rather than worry about things from the past, or constantly think about the future. A simple mindfulness practice could be to focus solely on the heat and taste of the tea you are drinking or the music you are listening to. By taking a few minutes before a big task; you can clear some of the clutter in your mind, eliminate procrastination and get into “flow” – which is where you do your best work. 2. Lower Stress: having no stress is almost impossible in modern society. But some of us do wear our “busyness” as a badge of pride. It shows we’re valued and that someone relies on us. It can be nice to be busy and have a sense of purpose. But combined with that unexpected bill, that extra drink you probably could have done without and the unreasonable request from your boss then stresses certainly takes a toll on our bodies. Focusing on finding your natural breath count can slow your heart rate, quieten certain parts of the brain, calm your digestive system and remind you of all the things that you already have to be grateful for. Remember that last holiday where you were truly carefree? Imagine being able to recreate some of that relaxed and stress-free feeling (albeit temporarily). You may not be on a beach or overlooking a beautiful scene but when you open your eyes again you’ll have renewed concentration and energy to eek out those extra few slides in no time. We’ve created this character who is somewhat separate from the rest of the world. But the nature of modern life is interconnected – you relied on somebody to design the mobile phone that you look at first thing in the morning, to maintain the road that you walked on, to produce the clothes you wear and to serve you that morning caffeine hit. Through meditation, we can build our emotional intelligence by silencing this “me.me.me” for a few moments and to acknowledge that everybody is also playing out their own stories in their own heads too. You can safely assume that they have anxieties and fears like you and me. By remembering that a colleague may be acting a certain way due to lack of sleep or by recalling what truly motivates your client you can become a better communicator , colleague, and leader. Some big corporates from Google to Blackrock are incorporating meditation practices to create the right calm environments for true teamwork to foster. We often demonize being a ‘cog in the wheel’, sometimes forgetting that great results do happen when everybody is motivated to do their best for a certain project. We can appreciate that some of the claims made from the meditation community are generic and that there are so many forms that it can be difficult to know where to start. You may have even tried before and given up.